Guess what? It’s time to start making your own almond mylk. Don’t worry, it’s not complicated or time consuming. On the contrary, once you have the right tools (a good blender and nut milk bag/cheese cloth) you are set to go! Why should you consider making your own nut mylks? Cow’s milk has significant levels of female hormones, and usually contains antibiotics, pesticides, saturated fat, and cholesterol — substances that definitely do NOT do a body good! Do you know that up to 65% of human population has trouble digesting lactose (dairy products), in fact East Asian people 90% of the population is lactose intolerant, which can cause gas, abdominal cramps and gastrointestinal distress. Raw nut mylk is truly a great alternative to get your source of nutrients such as calcium, Vitamin E, Vitamin A, Vitamin D and lots other minerals needed for our body. This pure almond mylk is so much better than store-bought stuff! Most of the organic boxed almond nut-milks have only 2% almonds, with a long list of filler (non-food) ingredients. The beauty of making your own nut mylk is that you can say goodbye to all kinds of additives, fillers, stabilizers, dairy, soy, carrageenan, xanthan gum and other (pardon my language) crap. What you will get instead is more real nuts, more good fats, more bio-available nutrients, and more true flavour. Not only is almond milk delicious and healthy, it goes great in tea, coffee, smoothies and even cereal! 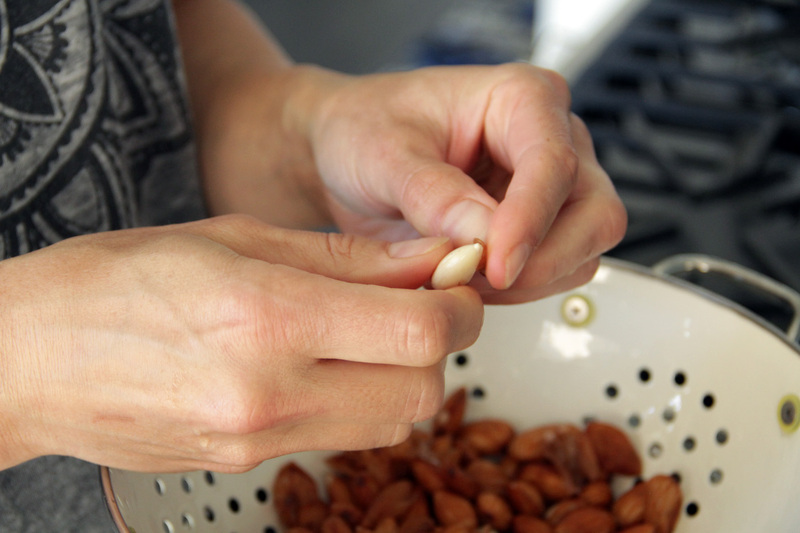 Drain the almonds and discard the soaking water. 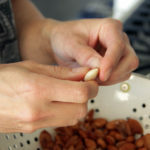 Once soaked and drained peel the almonds- basically all you need to do is press on the almonds with your fingers and the skin will come off easily. Rinse the peeled almonds under cold water and place in a good blender. Add 6 cups of cold water you are comfortable drinking (spring or filtered) and a pinch of salt. Optional you can also add 2-4 dates depending on how sweet you like it, and vanilla extract. Blend on high for about 60 sec. Store in glass bottle in the fridge for up to 3-4 days. This recipe requires a prep time of 12-24 hours. We suggest that you soak the raw almonds overnight to remove enzyme inhibitors, to allow optimal digestion and creamy taste. This is a basic recipe that can easily be used as a guide to create many other nut mylk variations. Now all you need to do, is gather the essentials and start to experiment with making your very own nut mylk at home. For more inspiration check out our HazelNut Mylk version.